Hi everyone! I just realized something– March 16th marked Crumbs and Nibbles’ one year blogiversary! One year (and a couple days) ago, I said hello to the blogging world for the first time and shared a recipe for Snickerdoodles with you. A few things have changed since then. Inspired by The Pioneer Woman, I started taking step-by-step photos (most of the time, at least), and a several months ago Crumbs and Nibbles got a makeover (I tried to dig up some photos of the old site, but couldn’t find any). I’ve learned so much about baking, blogging, and photography, and I’ve had the opportunity to interact with some wonderful people. So whether you come to to my blog every day or if you just happened to stumble upon it, thanks. Thanks for listening to me share about my mishaps and triumphs, and thanks for leaving such wonderful comments. Here’s to another year of happy blogging! Had I been observant enough to notice that my blog’s anniversary was coming up, I would have revisited the Snickerdoodles recipe I posted so long ago. But, because life is crazy right now (still working on that term paper I mentioned a few weeks back!) and because I am way too forgetful a person to remember such things, I decided to just stick with the cinnamon theme and share this recipe for Cinnamon Scone Bread from the lovely Mrs. Larkin via Food52– and along with it, the photo that, thanks to Food52, managed to rack up over 1,300 likes on Instagram. Thanks, Food52! This scone bread is complete heaven: think cinnamon sugar sandwiched between buttery layers of scone dough, then baked in a loaf pan. Are you drooling right now? ‘Cause I am. I wasn’t able to take step-by-step photos (because my hands were covered in cinnamon sugar for 75% of this process), but if you find yourself struggling to understand any of my directions, just head on over to Food52 and have a look at the photos there. 2. 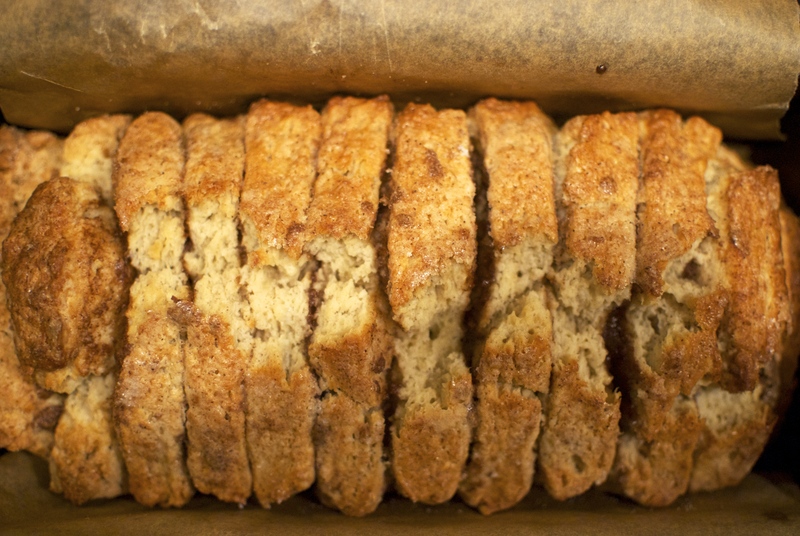 For the streusel: In a medium bowl, mix together flour, both sugars, and cinnamon. Stir in the cream and set aside. 4. In a large bowl or the bowl of a food processor, stir together or pulse the dry ingredients. Add the butter and pulse or cut with a pastry cutter (or your fingertips) until the mixture resembles coarse crumbs. 5. If you’re using dried fruit, combine it with the cinnamon in a small bowl and add to the dry ingredients. If not, just add in the cinnamon. Stir together. 6. In a large measuring cup or medium bowl, whisk together the cream, egg, and vanilla. Pour into the dry mixture and, using a fork, fold together the ingredients until a dough starts to form. Drop in a bit more cream if it’s still too dry, then plop the dough onto a floured counter or board. 7. Gently pat the dough into a 6″ x 14″ rectangle. Cut into 12 equal rectangles. Brush the tops of each piece with cream, then sprinkle some streusel onto 6 pieces. Flip a plain piece onto a streusel piece so that the cream faces the streusel. 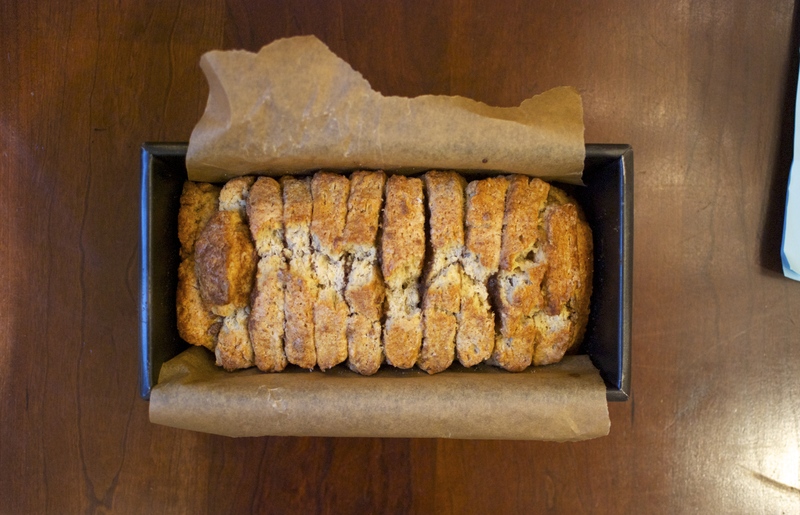 Repeat with each pair of pieces, then continue building layers by brushing on more cream and sprinkling more streusel. Lay the pieces (you can do this in sections) into the pan sideways (see the photo above or below). Brush the top of the loaf with cream and sprinkle with raw or granulated sugar. That’s it for this week! Thanks so much for visiting my little blog. As always, happy nibbling!